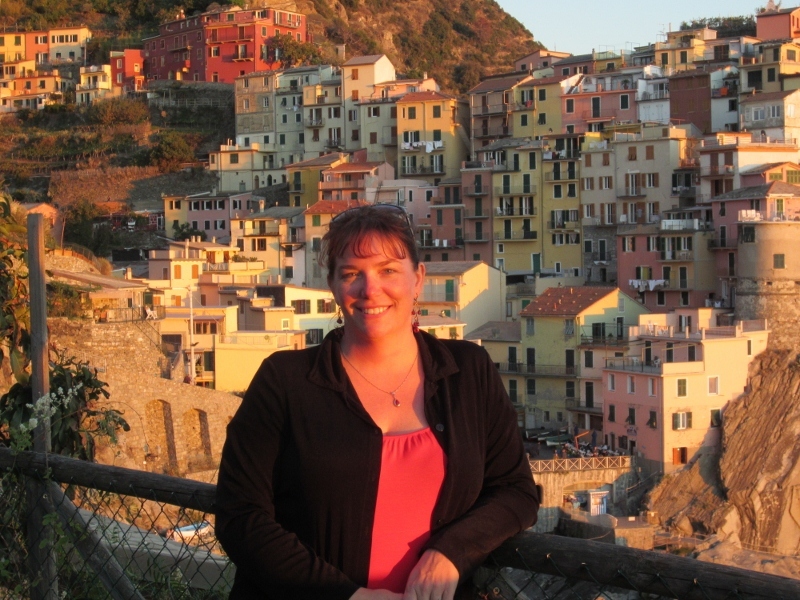 I loved the smell of the fresh salt air as it blew through the canyon-like village of Manarola. All the towns had a terraced nature, the streets winding upward gradually. It was impossible to get anywhere without climbing a hill of some sort. While there, the science nerd in me couldn’t help taking this picture of the eventful geology of the region. I’m no geologist, but this looks like uplifted sedimentary layers, but also in two directions (geologists, please correct me if I’m wrong). Each village seems to have dealt with the natural geology in stride, building on cliffs and slopes, terracing bare ground for use as personal gardens, and perhaps bringing in sand to make beaches more savory for tourists. The village of Monterosso is supposed to have the greatest number of resorts, and I can see why with a beach with views like this. We made sure to walk down to the water and put our feet in the Mediterranean. We also noticed parachuters riding thermals above the villages, they never seemed to come down on that 80+ degree F day. 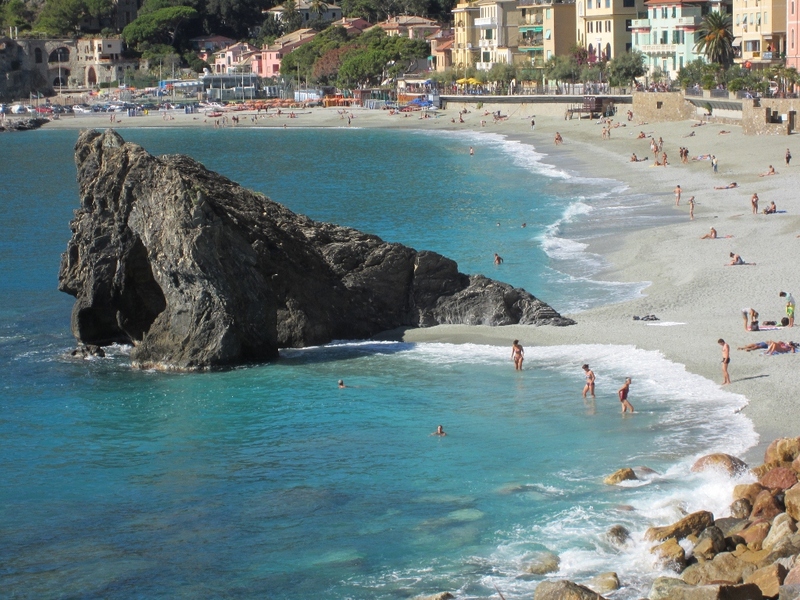 I can see myself returning to Monterosso with my husband someday for a special anniversary, easily as beautiful and memorable as any Mexican beach I’ve walked. It was also hard to pass restaurants with an atmosphere like this. I believe this one was in the village of Vernazza, although we visited four villages in a single day, so they started to run together. 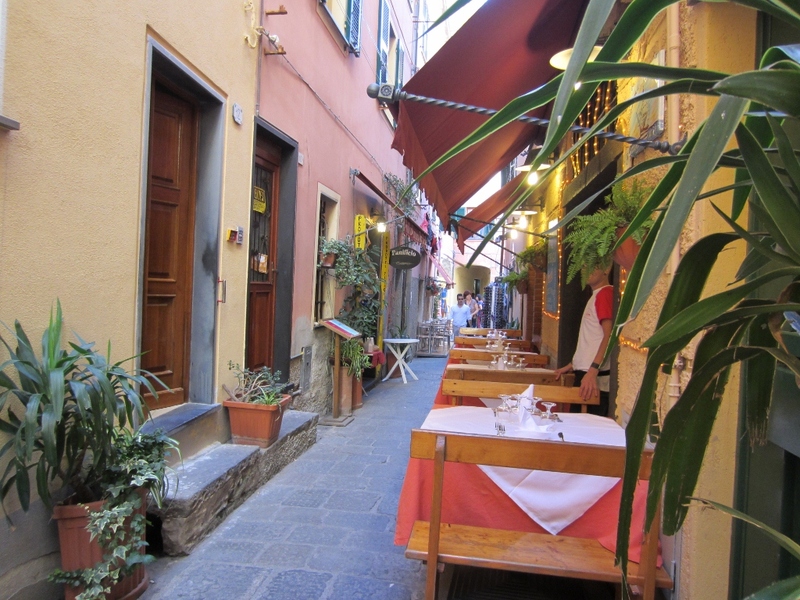 Each offered quaint little cafe’s where we could stop for a drink, antipasti, or a several course meal. 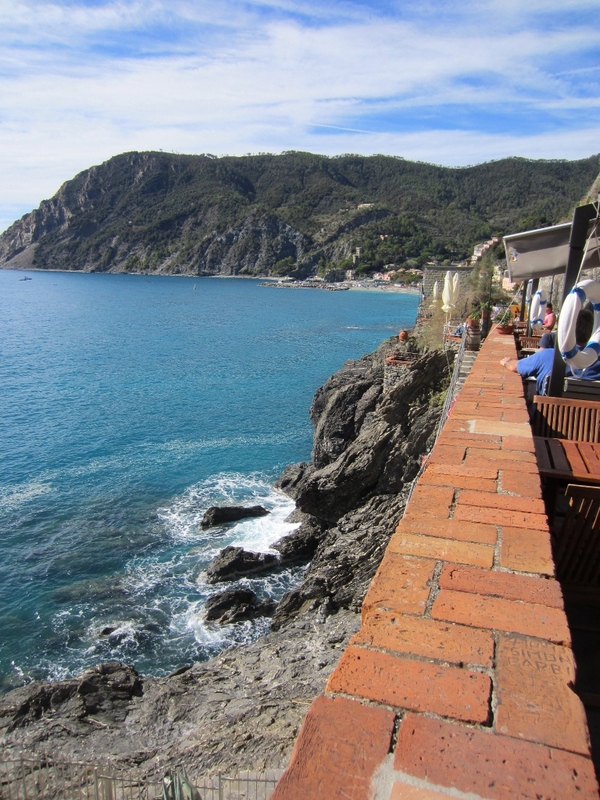 This restaurant in Monterosso (below) offered atmosphere and this view. My camera couldn’t quite pick up the exact, unique tint and shade of blue of the water there. 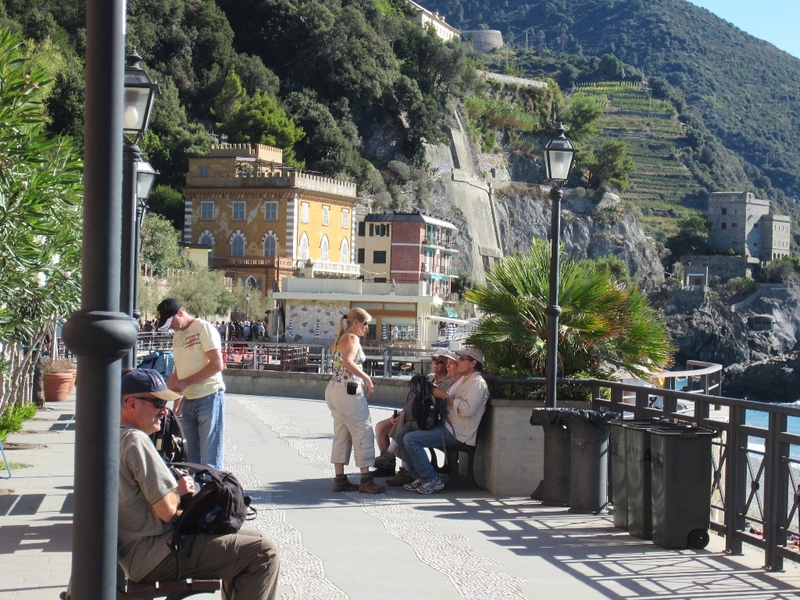 I could have sat in the marina of Vernazza all day long. Although we didn’t eat there, I’m told there is a great restaurant just to the right of this photo. We went inside the small church center left in this photo. The churches in the villages of Cinque Terre were less ornate and embellished than those in other Italian cities, but equally beautiful and historic. Each was very different, and I like the idea that a single church served most of the population of the village, bringing a small isolated population (pre-tourist inundation) together on another level. 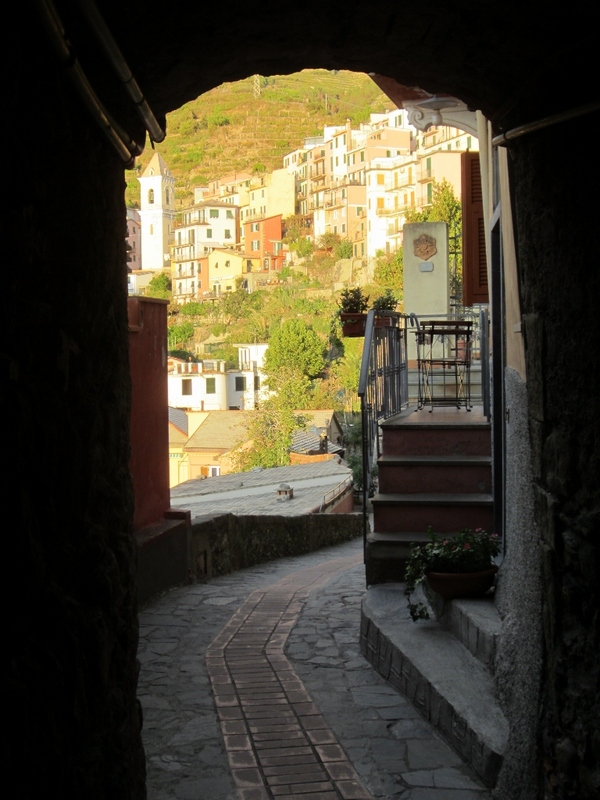 I took this picture of one of the villages (Corniglia, I think) from another of the villages. Each was pretty close together, connected by narrow walking trails that can just be made out in the photo below (rock below and vegetation above). A train also connected the villages, sometimes passing through ear-popping tunnels in this rough cliff rock. 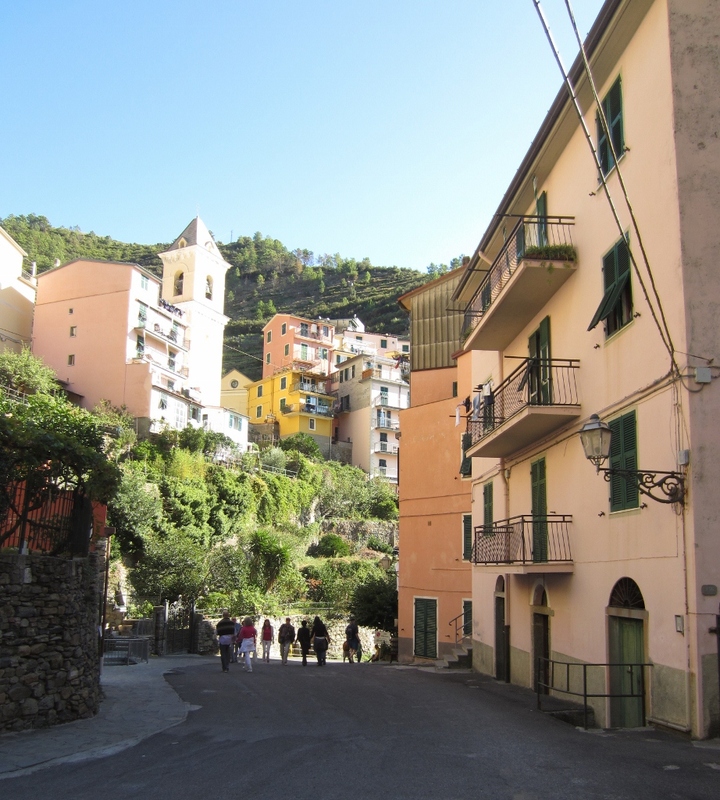 One village, that of Corniglia, was perched well above the water, and when we stepped off the train the walkway went in only one direction, directly toward a mountainous stack of stairs in switch-back form (below). Someone counted around 430+ steps on the way up. Even with my knee I was able to make it eventually, and I think challenges like this one have helped me in my recovery from knee surgery this week. 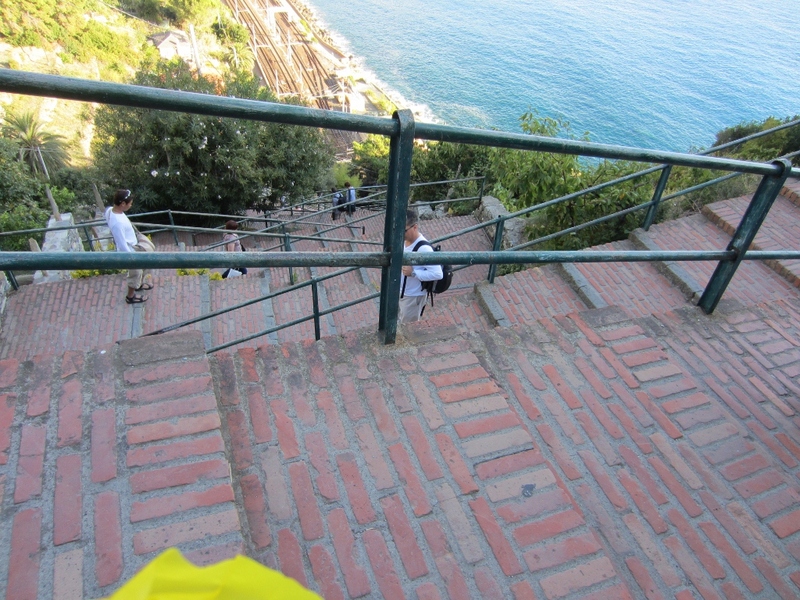 Of course, after lunch in Corniglia, we did the 430+ back down to the train. I think up might have been easier. 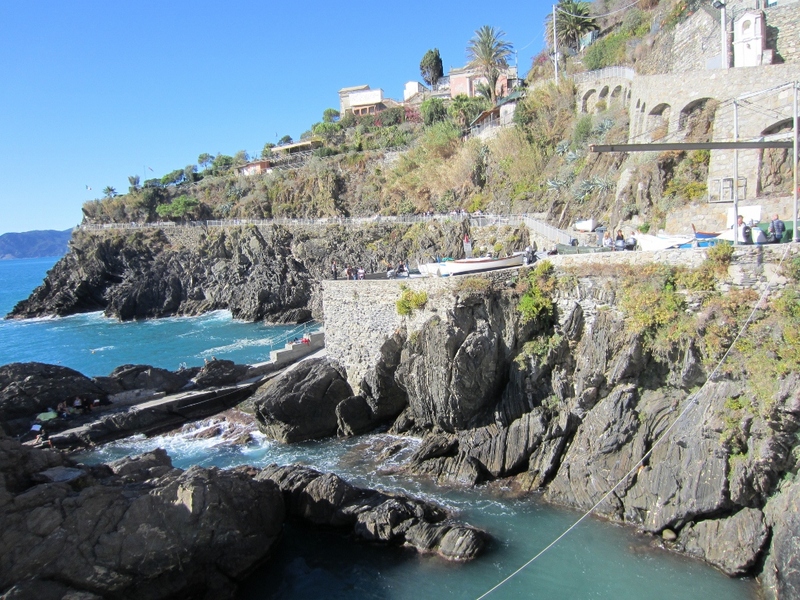 It was hard to leave Cinque Terre after only two nights there. I feel like we barely scratched the surface there so I look forward to returning someday with the whole family to explore for something closer to a full week. It seems like we just missed a lot of upheaval in this area, according this article in the Washington Post. Flooding from torrential rains early last week caused at least nine deaths and significant damage to buildings in these lovely villages, as well as parts of Tuscany. Tomorrow I’ll share some of the photos of our four days in Rome, a city also recently in the headlines for an “Occupy Wall Street”-like protest that went a little crazy. But more about that tomorrow. Cinque Terre means “five villages” in Italian. 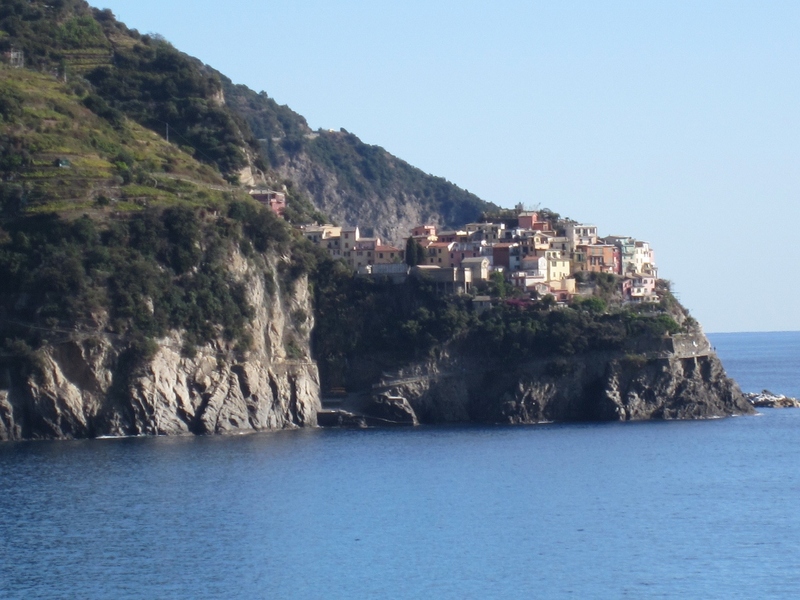 You won’t find it as a single location on a map, but instead you’ll find the names of each village (Riomaggiore, Manarola, Corniglia, Vernazza, and Monterosso), which are all part of Cinque Terre National Park. This destination has gained popularity recently, since Rick Steve’s declared it his favorite location in Italy. 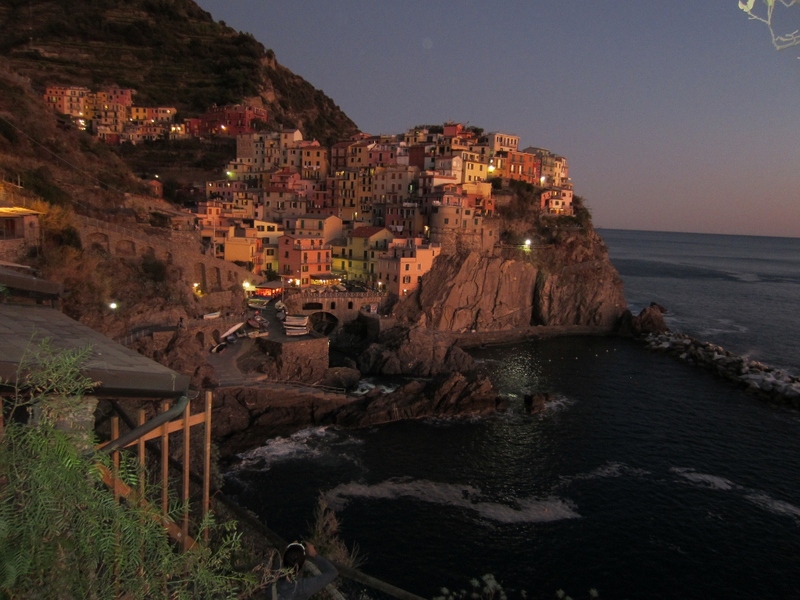 The villages are literally perched on hillsides along the Mediterranean sea on the northwest coast of Italy. The villages are connected by hiking trails (for which you must purchase a 5 euro National Park pass) and also by train. My companions were not in the mood to hike, perhaps out of consideration of my gimpiness, but more likely because it was the third italian city we’d visited and burning the candle at both ends was catching up to us. 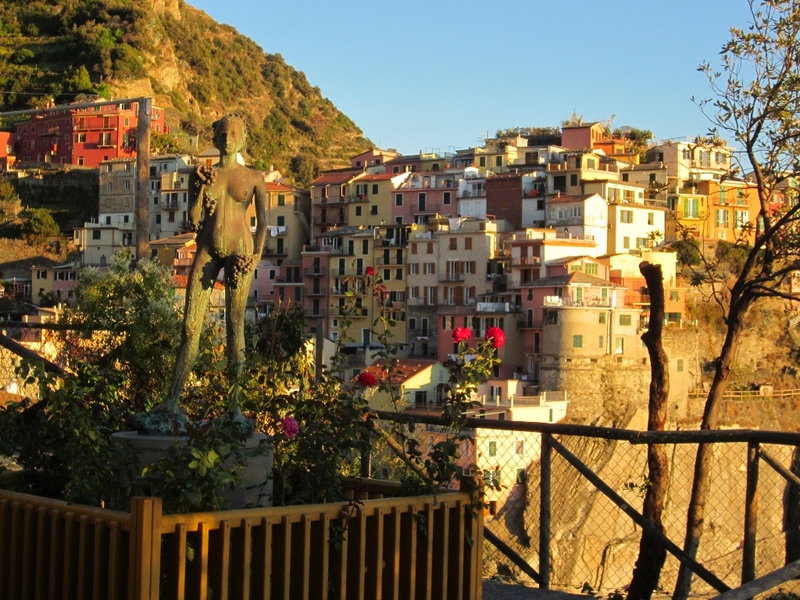 We stayed in the village of Manarola, considered one of the quieter towns. We also stayed there Sunday and Monday nights, two of the quietest nights of the week in most Italian cities. The villages are also connected by roads at higher elevations above each village, but we only rarely saw a vehicle. 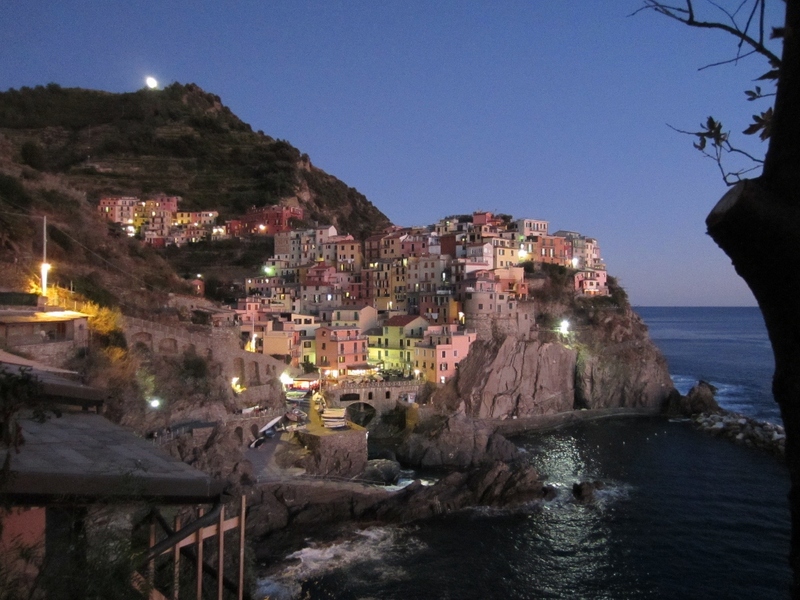 Because Manarola was so beautiful and relaxed, we spent a lot of time there and most of my photos are of that village. It’s beauty changed throughout the day and so I just kept taking photos as it got more and more enchanting. 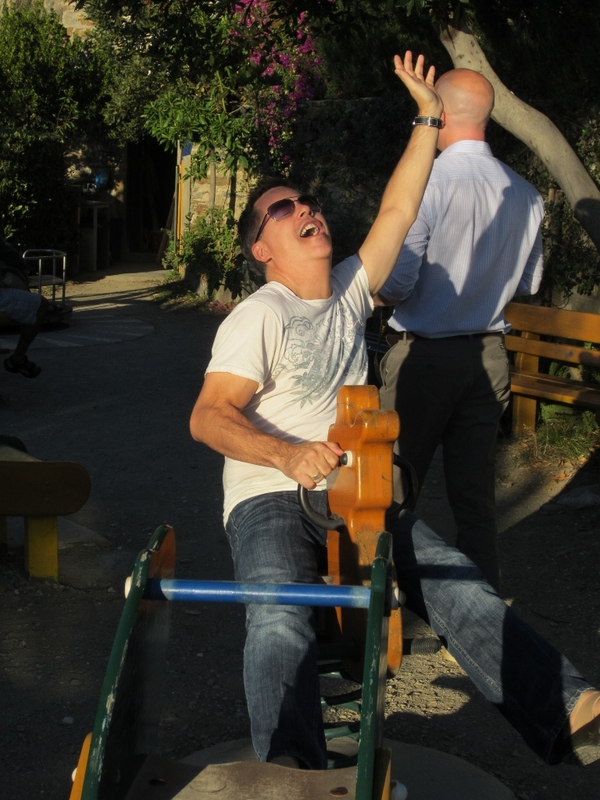 We hiked up to a small park perched on a hillside each evening to watch the sunset, drink wine, and be silly together. Cowboy Ken tamed this bucking bronc. The view from our room was also among the best of the trip. This looks out at the ocean from our room. The park we played in was midway up the hillside from the left. 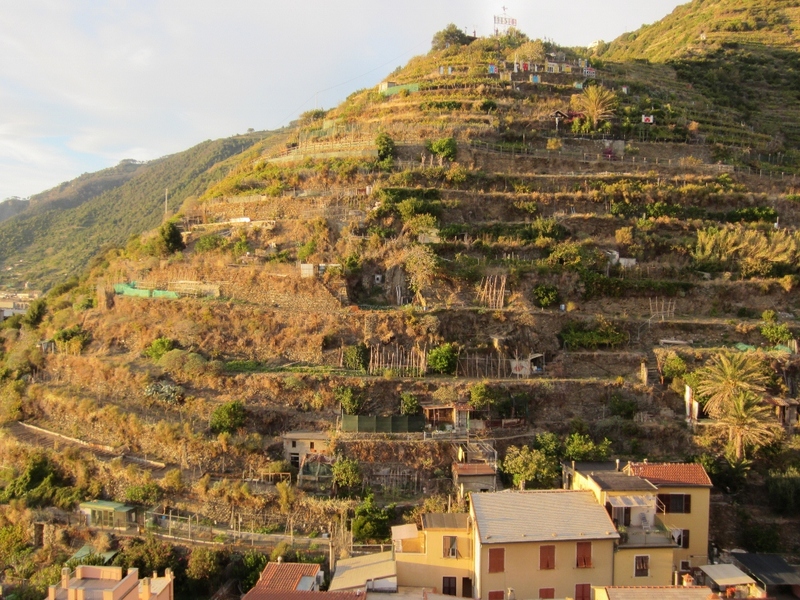 Each village also had terraced hillsides containing small gardens, presumably of the vegetable variety. In each of the villages, you can see the influence of tourists. 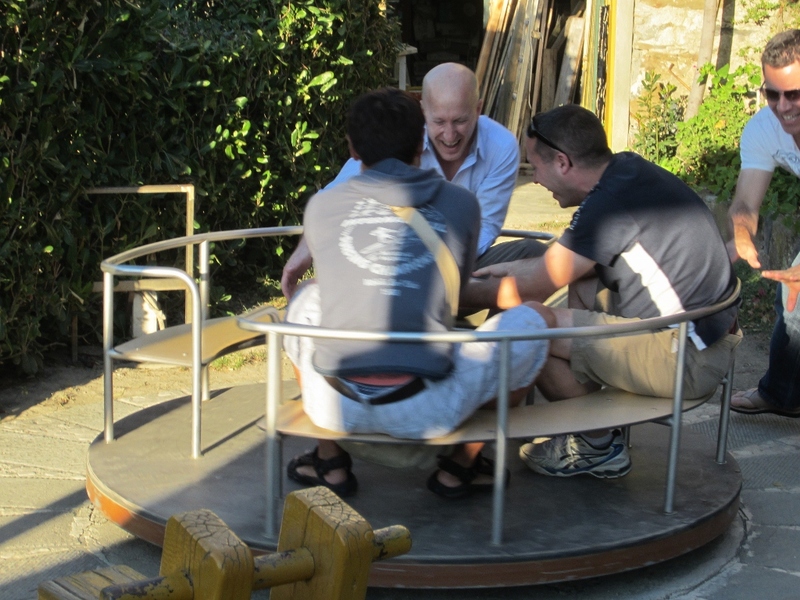 We witnessed a game of “spin the bottle” in this square at the center of the village. Small shops sold tourist items like post cards, scarves, and hand-made pasta and wine. 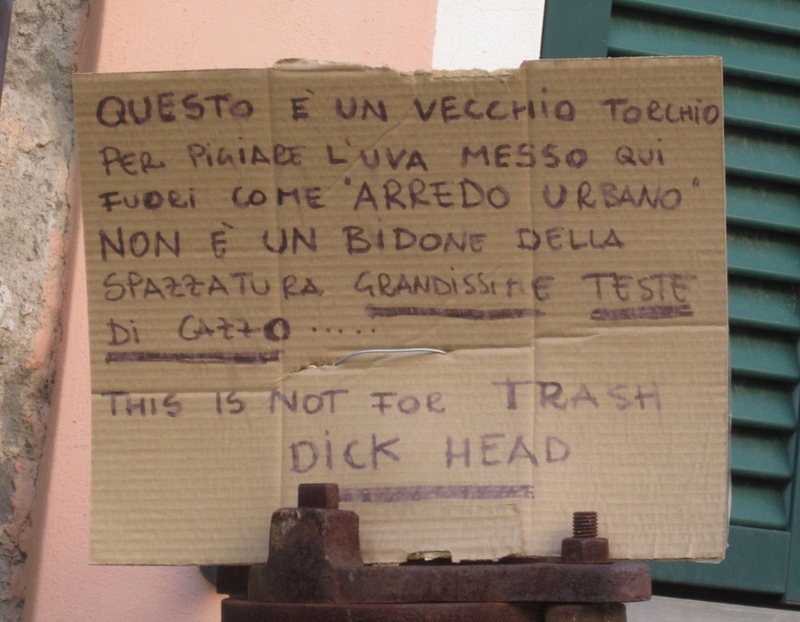 Very occasionally, we saw a note addressed directly to tourists. Or I guessed it was for tourists since it included an english translation. 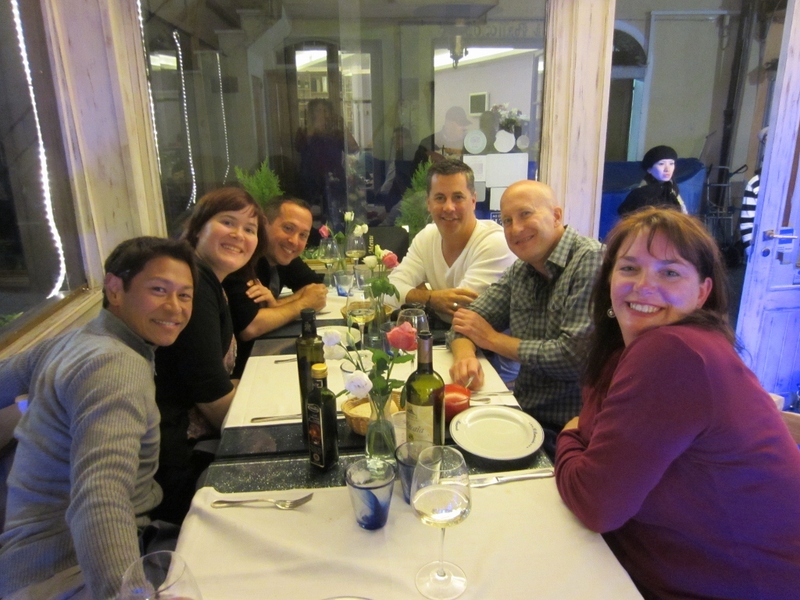 Manarola also had great restaurants. 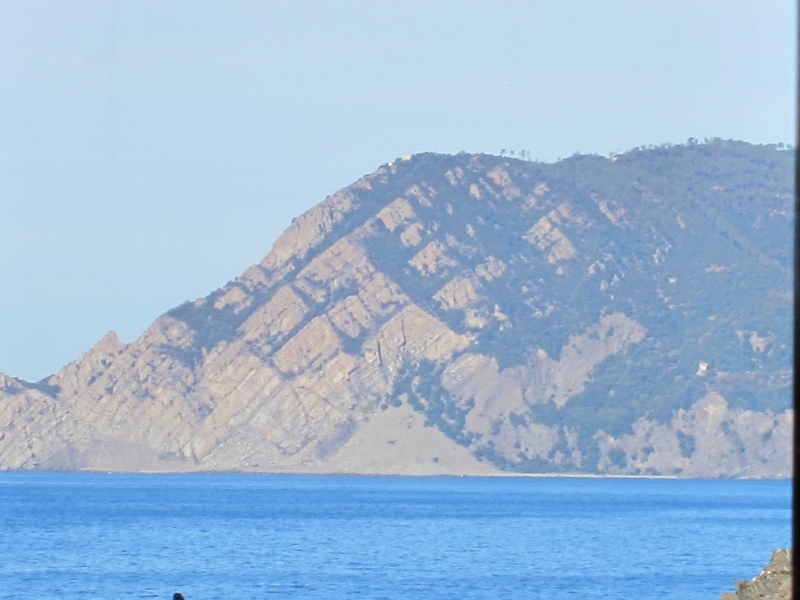 This area is famous for originating pesto and focaccia and well-known for its anchovies and other seafood. Manarola also offered more American breakfast options than any other location we stayed in. 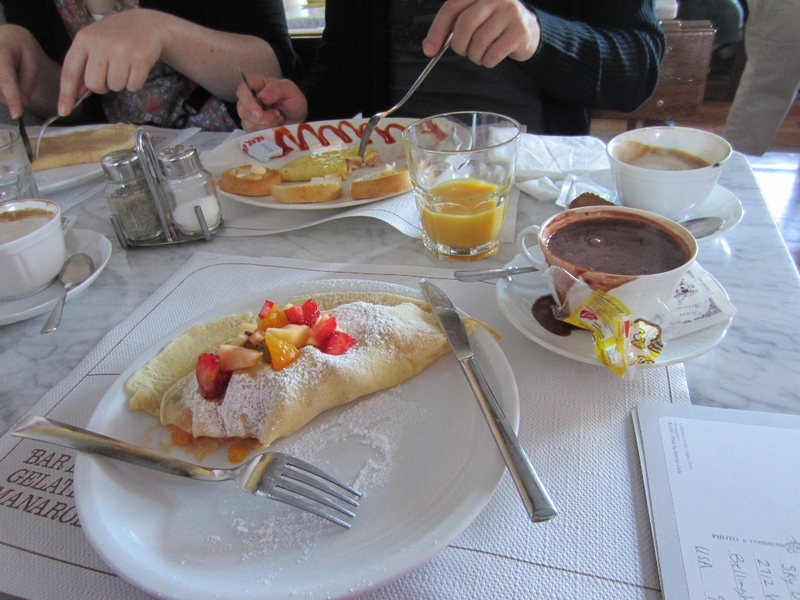 But instead of American breakfast, I opted for this fruit crepe and a hot chocolate. Hot chocolate in Italy is not made from some powder or syrup, its made of some version of melted pure chocolate. My cup below was so rich and thick it was more like a melted mousse than a hot drink. Mind you, I’m not complaining, simply stating a fact. I think all my companions would agree that we found a restaurant with the largest portion sizes, la Trattoria Locanda Il Porticciolo, because we all groaned when they brought our second courses and we could barely walk home after eating antipasti, pasta and fish courses at this restaurant mentioned in the Rick Steves’ book. 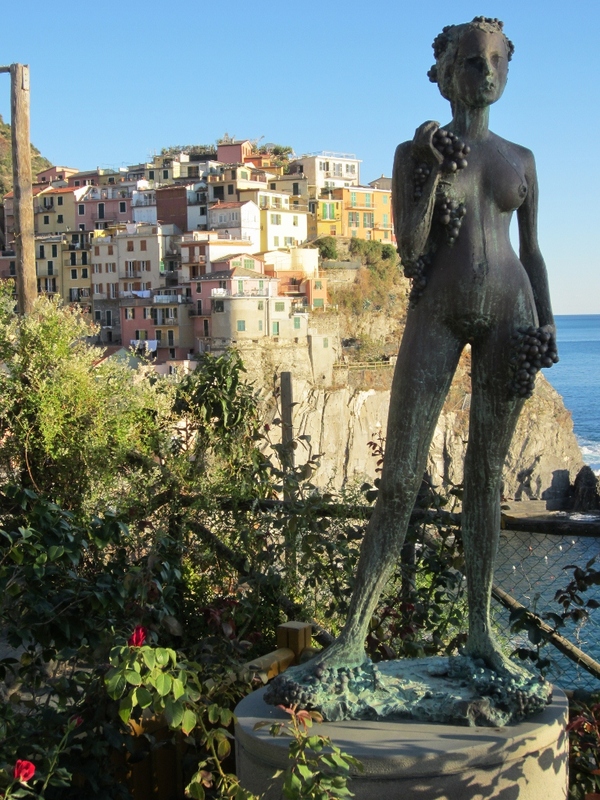 Tomorrow I’ll share more stunning photos of the other villages of Cinque Terre. 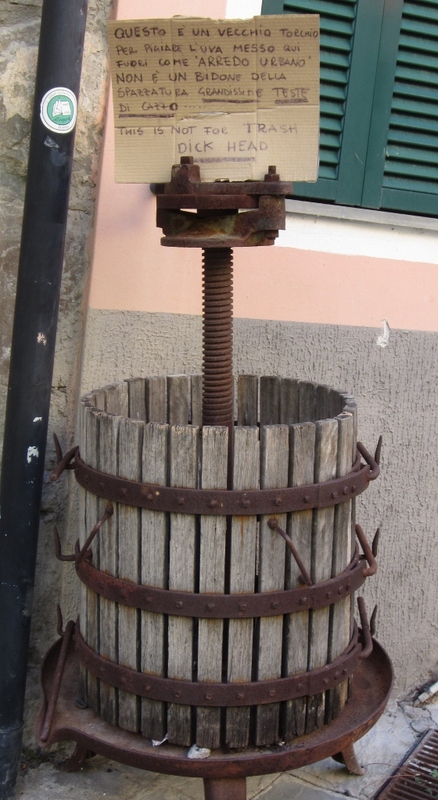 I made it back safe and sound from my two-week trip to Italy. Read about how the hubby and kids fared while I was away over at Easy to Love, and see the first of my photos. 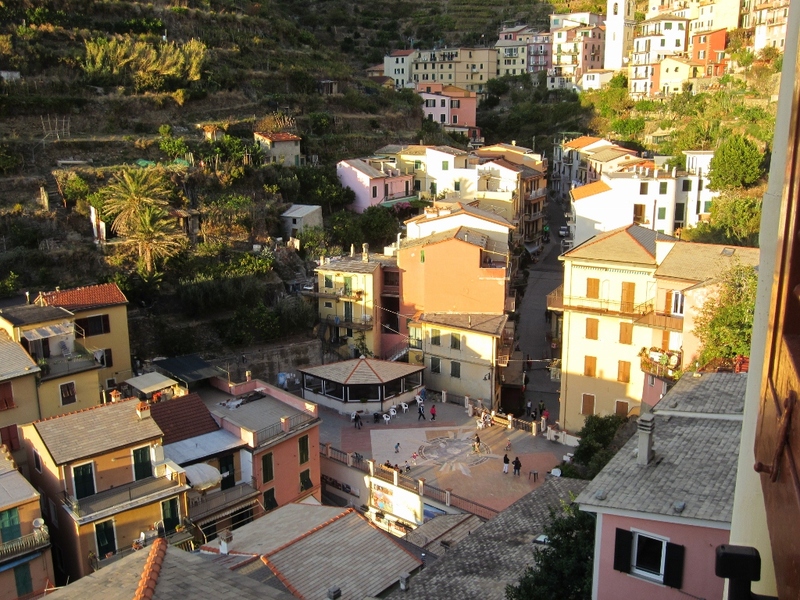 The Village of Manarola, part of Cinque Terre (5 villages), Italy. Beginning tomorrow, I’ll post here daily about my trip, so check back often if you’re interested in vicarious living your way through Venice, Florence, Cinque Terre and Rome, Italy.